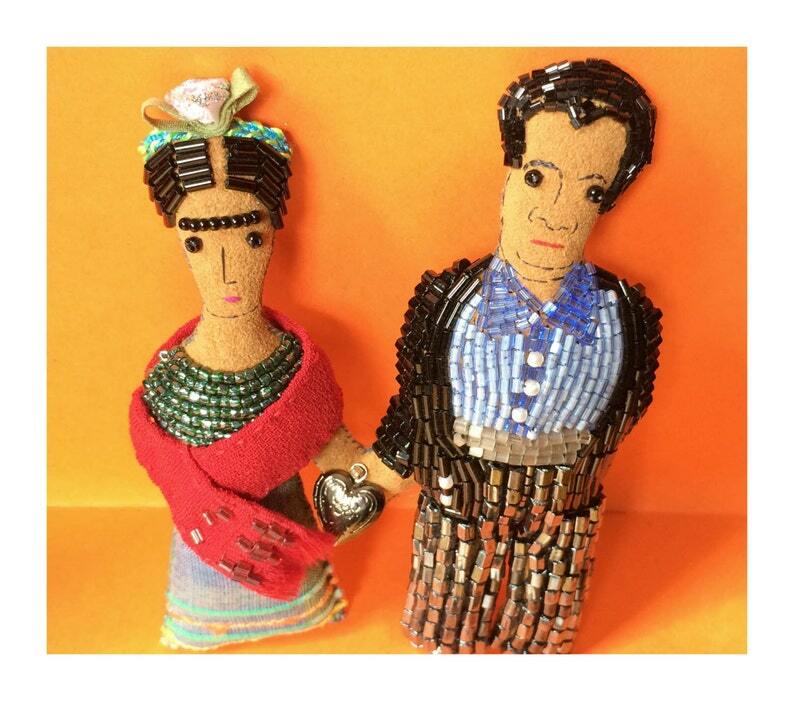 This "mini" Frida Kahlo and Diego Rivera Art Doll Set would make a great wedding or engagement gift, since it was inspired by their wedding portrait! 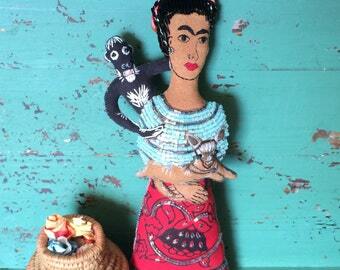 It would also make a great anytime gift for any Frida Kahlo fan or folk-art lover! Size: Frida—Approx 4 ½ ” tall, 1 ½” wide; Diego—Approx. 4 ¾ ” tall, 2” wide, joined at hand (one set). The dolls are incredibly detailed and took about 4 days to make. The two dolls are joined at the hand, and are holding a small heart locket (which does in fact open). The set was inspired by Kahlo’s 1931 wedding portrait of the couple. The Frida doll is wearing a traditional wedding costume (as Frida did for her wedding, and in her portrait): a green top and skirt and a red, gauzy shawl. Her skirt and shawl are made from recycled fabric. I added additional beadwork to the shawl. Frida is wearing a glittery silver and white rose in her hair, along with a turquoise and green ribbon. Diego is wearing a suit made entirely from beadwork, a blue shirt, and a wide grey belt. I embroidered his face using a lot of detail to try to make him resemble the real Diego (though he is lacking the voluminous belly). I tried to accurately mimic the proportions and simpler-folky painting style used in the portrait. Kahlo painted the wedding portrait two years after the pair was first married (Hayden Herrera 61). NOTE: The set pictured in the listing is not the exact one that you will receive. Each doll varies slightly due to the handmade process, and if you would like an exact picture of the set you will receive, I will be happy to send one upon request.